Buying a pet? Being told Canine Carriers will deliver it to you? BEFORE sending any money click here. So the time has come to move and your family includes one or more four legged furry loved ones. Cosmopolitan Canine Carriers knows that moving is a very stressful time in your life and moving with your pets can add to that stress. The logistics, coordination and attention to detail required to safely and efficiently transport pets can be completely overwhelming. The good news is, moving with your pets doesn't have to be stressful anymore because we're here to help! We can handle all the details of moving your pets from anywhere in the world, to anywhere in the world, door-to-door so you can spend less time worrying! 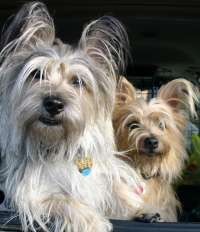 Simply stated, Cosmopolitan Canine Carriers is in the business of relocating household pets. We have successfully relocated the pets of tens of thousands of families door to door worldwide since 1972. Our entire staff of experienced pet relocation professionals is dedicated to providing you and your pets with the highest level of service possible and we'll beat the price of ANY competitors written quote by 5%! Cosmopolitan Canine Carriers is the best of both worlds. We have the the heart of a family owned business with the resources and experience of a corporation. All of the friendly and knowledgeable pet relocation specialists working for us are animal lovers themselves. We have the most extensive network of pet relocation professionals in the industry. No pet relocation request is too big or too small for us! Rest assured. When it comes to relocating household pets, you're definitely in the right place. We are proud to say that we provide a comprehensive list of pet relocation services to our clients that are second to none in the pet relocation industry. The best service and the lowest prices. Try us and we're sure you'll agree. Cosmopolitan Canine Carriers is the right choice for all your pet relocation needs!